We are excited to offer you the best "imitation" braintan we have ever found. So what exactly is imitation braintan? By "imitation," we mean that the hide was processed using a mechanical process using machines, chemicals, etc. as opposed to hand-tanning using manual labor and the brains of the animal. Generally, the mechanical method results in a skin that, while tanned beautifully, is hard to bead on and results in a lot of broken needles, wasted effort, and sore fingers. Not these hides! They look very much like real braintan and the best part is that they bead almost exactly like the real thing! As purists, we are skeptical about imitation braintanning methods because they usually result in poor quality leather. But these hides are great! Really. They are the first imitation braintan that we would use for our own craft projects. The primary difference between these skins and genuine braintan is that the imitation is a lot heavier in weight. They feel more like commercial tanned leather in that respect. However, the skin surfaces are slightly sueded on both sides like real braintan and they have similar body and texture. Truly excellent and we have no problem recommending them to anyone, even purists like ourselves. Now granted, we still like working with the real thing, but we would have no problem using these skins either. Oh, and here's the best part — they cost about 1/2 the price of real braintan! Buy one and see for yourself. If you don't like it, just return it. All of our products have a 30-day money-back guarantee. Please note that these are always in limited supply. If you need matched hides for a project, you should probably check with us first for availability. 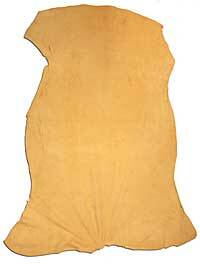 Beautiful buckskin hides that are light smoke in color. Excellent quality! Great for moccasins, pipe bags, shirts, leggings, and many other projects. Needles pass through the skin just like real braintan. Highly recommended. Please note that sizes are approximate. We sell these by the square foot so you only pay for what you receive. The actual price you pay may vary by about 10%. If you require matched hides (color or shape) or need special dimensions for your projects, please indicate this in the "special instructions" box on the order form (presented when you complete your order). You may mix smoked and white imitation braintan hides for the quantity price. Here's a great buy! We have a good stock of our imitation braintan in a B grade. Now don't be put of by the "B". The only difference from this grade and the the regular select grade is that these may be a little irregular shaped, have some minor holes, or maybe have a little uneven coloration and thickness. In fact, if we didn't tell you they were "B", you probably would not know! Really excellent for non-clothing projects like moccasins and pipe bags. Needles pass through the skin just like real braintan. Highly recommended. 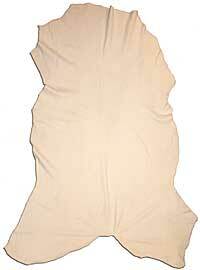 You may mix smoked and white "B" imitation braintan hides for the quantity price.